Preheat oven to 250 degrees F. Place foam cups upside down on a dark coated cookie sheet. Place cookie sheet in preheated oven and watch carefully. Cups should have begun shrinking at the 2 minute mark and should be done at the 3 minute mark. You may need to adjust the temperature up or down depending on your oven, so only try 1-2 cups at a time until you are successful. If you have some brims that are flat, make hats like these miniature spring bonnets! The cups will cool quickly and can be painted within minutes of coming out of the oven. paint each pot, inside and out with acrylic craft paint and let dry. Make flowers using different lengths of chenille stems. Use green for the flower stems and a variety of colors to make the flowers. Wrap chenille around the handle of a paintbrush to create flower buds, and twist longer coils to make snapdragons. 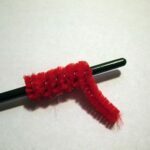 Form flower shapes by bending a chenille stem into petals and secure it with the end of the chenille stem. Add a dab of white glue and insert the green stem into the colorful flowers. Squeeze a generous amount of white craft glue into the bottom of each flower pot. Press a penny into the glue to give the pot some weight. Add more glue to the sides of the inside of the pot. Cut a piece of green tissue paper about 5″ square and crumple it in your hand. Place crumpled tissue paper into the pot. Add a dab of glue to the bottom of each flower stem and insert into the flower pot. I have been making crafts from shrunken foam cups for ten years. In that time I have spoken with a few different experts on the matter of what is emitted from the foam cups when heated. I’ve been told the levels are low enough that it shouldn’t be cause for concern, but that running your kitchen vent or if weather permits, keeping a window open during the baking process is an acceptable solution. This project for Styrofoam Cup Mini Spring Flower Pots was printed from CraftsbyAmanda.com - https://craftsbyamanda.com/styrofoam-cup-mini-spring-flower-pots/ and can only be printed for education or personal use.